1. For connection through Bluetooth, and the receiver device is your Samsung Galaxy S5, tap and hold Bluetooth on the indication panel. 2. 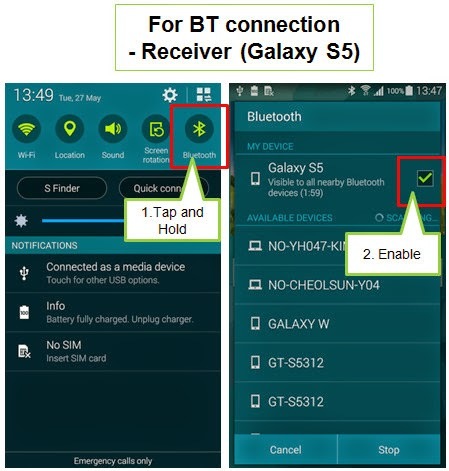 Enable the option "Galaxy S5 Visible to all nearby Bluetooth devices on Receiver device." 1. 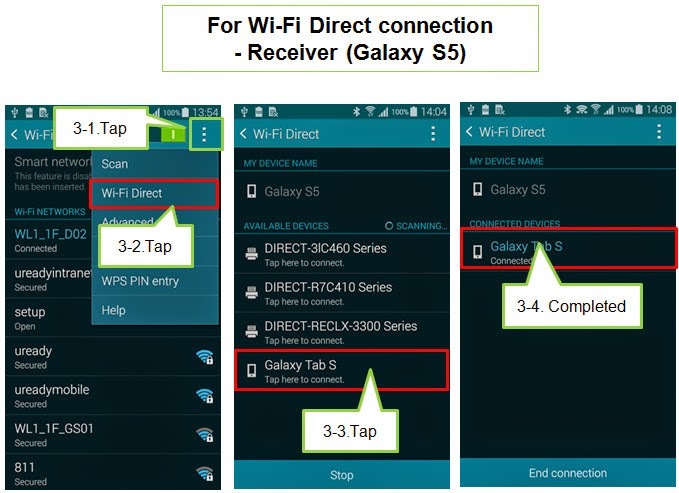 For connection through Wi-Fi Direct, connect the (sender/receiver) devices via Wi-Fi Direct in More options. 2. Tap on the icon represented by 3 vertical dots on the upper right corner next to Wi-Fi Direct. 3. Tap to select Wi-Fi Direct from the available options. 4. Scroll down to select the sender device from you want to connect with your Galaxy S5. In the illustrated image below, Galaxy Tab S is the selected. You should now see your receiver device (Galaxy S5) connected to the Galaxy Tab S. You may now retry sending files from the Galaxy Tab S to your Galaxy S5.